SAVE THE DATE FOR GREEN SEATTLE DAY 2019! We may be months away, but we still can’t help but to be excited for our annual Green Seattle day events! Save the date for Saturday, November 2nd, 2019, to be a part of our biggest event of the year. 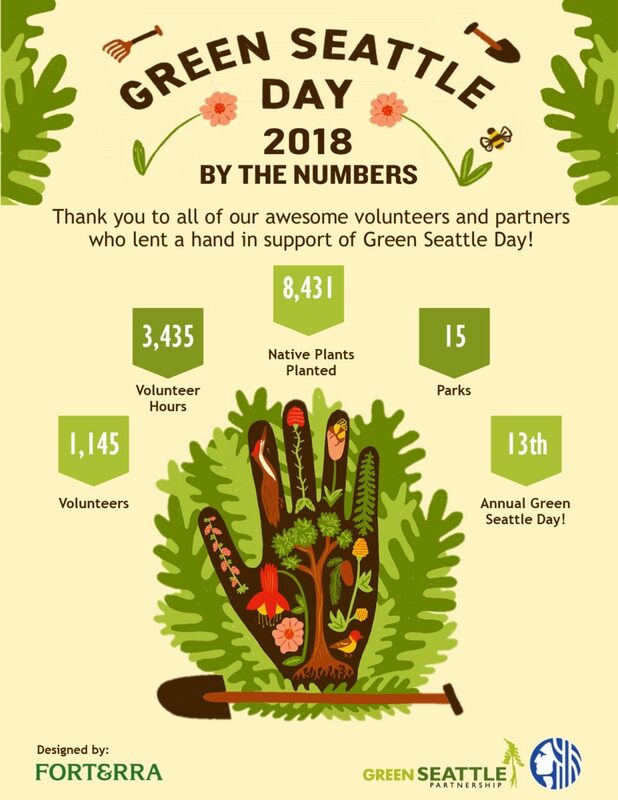 Check out our achievements below from Green Seattle Day 2018, and get inspired to take part this year. Don’t wait until November to volunteer; remember we have opportunities year round. Supporting Green Seattle Day with a financial donation or an in-kind gift makes this event possible and is a great chance to showcase your business’s commitment to a green, healthy Seattle. Want to see your business here? Contact us to join us as a sponsor.